Sony Xperia XZ2 hands-on hands on review | What Hi-Fi? Sony is back with a new flagship smartphone, and it's betting big on HDR. Sony is up to its old tricks again. Just six months after launching the Xperia XZ1 at IFA 2017, its back with a new flagship to make your relatively up-to-date phone feel like old hat in half the time. While we can’t quite understand Sony’s thinking behind this, it has at least made some decent steps forward – particularly in the sound and vision stakes – that suggest the XZ2 could hold its own against the Samsung's and Apples of this world. But can it convince enough people to make the change? We spent some time with it to find out. Sony’s design team have decided to give the XZ2 a design overhaul, and not a minute too soon. Previously, Sony’s phones have been a little on the boxy side, with hard edges and angular corners that made it feel a little serious rather than stylish. While the new Ambient Flow design is still not quite as head-turning as the Samsung Galaxy S9 or the iPhone X, it does feel nicer to hold than previous iterations, with a curved back panel that tapers at its edges to fit nicely in your hand. Front and back are covered in sturdy Gorilla Glass 5, with an anti-twist and bend aluminium frame that runs around the edge and makes the XZ2 the most durable Xperia yet. It’s still quite bezel-heavy compared to the competition though, and Sony’s decision to bring the colour from the handset’s back panel around to the front doesn't help disguise it. Now it's just more obvious how much of the front panel isn’t screen – though you are getting a 13% more of it than before due to the XZ2’s adoption of an 18:9 screen ratio. It comes in a choice of black, silver, blue and pink, which shimmers almost like chrome underneath the glass finish. Thankfully it isn’t as much of a fingerprint haven as the XZ Premium was, but like any glass-backed phone, you’ll still find yourself wiping smeary marks off it regularly without a case. Speaking of fingerprints, the scanner that was so awkwardly located on the side of the handset on the XZ1 has now been relocated to underneath the camera on the back panel, which makes for much easier access. As mentioned above, the 18:9 screen ratio in the XZ2 enables Sony to cram more screen into its new design, offering a 5.7in display (up from 5.2in) but in a narrower body than last year – down from 73.4mm to 72mm thick. It’s Full HD+ resolution, packing 2160 x 1440 pixels, and comes with support for HDR, allowing you to playback compatible content from the likes of Netflix and Amazon. That’s no different from last year’s XZ1, but this time, the XZ2 packs clever tech from Sony’s Bravia TV range to upscale SDR content to near-HDR for punchier colours and improved detail in the shadows and highlights. This tech forms part of Sony’s updated X-reality for mobile engine, which we haven't tended to like using on previous Sony handsets. However, a demo during our hands-on time certainly showed a natural-but-noticeable uplift in colour saturation and detail with SDR content, so we’re willing to keep an open mind ahead of our full review. While the cameras on the XZ2 haven’t changed much on paper (a whopping 19MP on the rear, and 5MP on the front), they do get a few extra tricks up their sleeves – including a world-first. That is the ability to record video in 4K HDR to a 10-bit colour depth in the HLG variant of HDR. We saw this in action, and from our brief demo, it certainly appeared to balance out tricky indoor lighting situations, holding on to more detail and better colour variation in the process. Another new edition is the ability to capture super slow-mo video in Full HD at 960fps. The Sony XZ1 was the first smartphone to offer this last year, but has since upped the resolution from 720p for even more detail in playback – matching the Samsung Galaxy S9’s capability to do the same. Elsewhere, the 3D Creator feature that creates a 3D render of your face using phone’s rear cam, can now do the same via the selfie cam. That makes it easy to make a carbon copy of your face without the help of another person, and while its functionality has been rather gimmicky so far, a new update to Facebook means you can now share the results directly to your feed, rather than via an external link. If that still sounds rather gimmicky to you, we’d be inclined to agree. But the hope is that they may be able to be used as more accurate online avatars at some point in the future – particularly now the processing has been improved even further on Sony’s servers. We did think it worth pointing out that during our time with the XZ2, we experienced a few crashes when shooting in the camera app. We’re putting this down to the early software on the demo devices though, and expect this is all smoothed out in time for the phone’s release in April. Sony has long been a supporter of high-resolution audio, as well as including its LDAC technology for an improved wireless music performance with compatible headphones. Unsurprisingly, nothing changes here in that regard, but what does change is Sony’s support for the headphone jack. Like HTC, Huawei, Google’s Pixel family, and of course the iPhone before it, the XZ2 has ditched the headphone jack. To listen to your music through a pair of headphones, you’ll need some of the wireless or USB-C variety. There are stereo speakers for ditching them entirely of course, which are, at the very least, Xperia’s loudest to date. They also come with S-Force Front Surround Sound processing for a wider audio performance – though you won’t get the detail reproduction you will with a pair of cans. The Sony Xperia XZ2 won’t be the only flagship phone of 2018 using the Snapdragon 845 processor at the heart of its operation, and alongside 4GB of RAM, it should blaze through just about every task you throw at it. Aside from the few hiccups we experienced when in the camera app, which we’re putting down to pre-production software rather than any hardware concerns, we whizzed around the phone without issue. We’d expect this to be no different come our full review. The XZ2 comes with a decent 64GB of storage plus microSD card slot expansion, which should give you plenty of room to manoeuvre when it comes to media hoarding, while the built-in 3180mAh battery promises to keep you in juice for up at least a full day. We’ve always been pretty impressed with Sony’s battery performances so we’re hoping this doesn’t change with the introduction of HDR video with HDR upscaling. The glass exterior ensures that Qi wireless charging can be built in too, though like most phones with this tech, you’ll need to fork out extra for a charging pad. Sony has been supporting waterproofing and dustproofing in its flagship phones for years, so you can expect the same here with a rating up to IP65/68. We’re unsure why it’s straddling two ratings, but just know that if it takes an accidental swim in the bath, it should emerge unscathed. In a rather interesting ‘and finally’, the Sony Xperia XZ2 has added in a new Dynamic Vibration System to the phone, which works a little like a DualShock controller for the PS4. You can choose when to have it on, and to what extent, but it basically analyses the audio data from the phone and backs it up with haptic feedback for a supposedly more immersive experience. We can see this working well when gaming, but tried it out during movies and music and weren’t so convinced. We’d expect it could take a hit on your battery life too, so using it sparingly may be well advised. 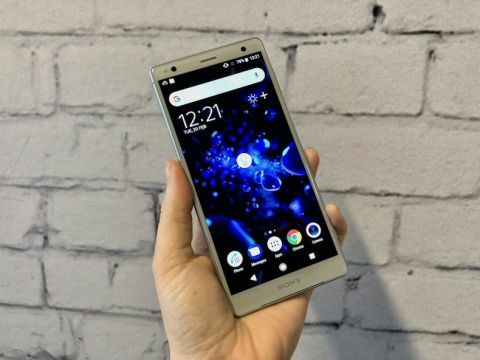 Sony has impressed us before with their smartphones, but after losing its way a little with the demise of the Z Series, the XZ2 looks like a step in the right direction for those who put sound and vision first in a smartphone. The HDR functionality is certainly something we’re looking forward to trying out further – particularly the upscaling feature – and we’re also keen to give its Sony-tuned audio a good demo too, even if it does mean using an adapter. It’ll still be a tough sell against impressive flagships from the likes of Samsung, LG and Apple, but we’re looking forward to spending more time with it to find out how well it fights its corner.